Many year ago, in a galaxy far, far away we lived in Hawaii. My husband was station there with the Marine Corps. On the Chinese New Year we took our children, ages six, four, two and seven months, to Honolulu’s Chinatown festivities. It was all very exciting. 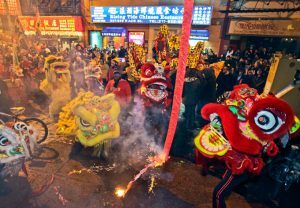 Lanterns hung everywhere, firecrackers exploding, the paper dragon snaking through the streets. The children were mesmerized. My husband caught sight of two Marines who worked for him and who frequently found themselves in scrapes. Being big daddy marine went to caution them to stay out of trouble. I stayed back with the children. A few feet from us, one of those ten foot long strips of firecrackers was lit. The children and I were enveloped in a thick smoke with bits of paper flying everywhere. I maneuvered the stroller with the two youngest against the wall and did my best to wrangle the two older children behind me for protection. A young Chinese woman came to the door a couple of feet away and shouted to me to come in. I went. She helped me hoist the stroller up the steps and inside to an elaborately decorated room. I thanked her profusely and we stood just inside waiting for the smoke to clear. Soon five or six young women appeared with Chinese sweets for the children who snarfed them down. All the ladies were gushing over my beautiful children. I see my husband standing on the sidewalk frantically looking for us and called out to him. He turned and through the smoke he looks in at me with the most god awful look on his face. One of the ladies motions for him to come in. He stood frozen, staring at me. The lady who had invited us inside called to him to come in and have a beer. That did it! He came in and in seconds he’s offered a beer, which he took without a word and I might say still starting at me. I looked around and realized he is right. All I could do was smile up at him and shrug. He sighed, shook his head and gave me his patient smile. Finally he wrapped a long arm around me, pulled me close and graciously thanked the lady for the beer. A sound at the door caused us to turn. There in the doorway were the two Marines my husband had caution to stay out of trouble. The look on their face when they saw him with his family inside was priceless. Recovering, they ducked their heads and silently disappeared back into the smoke and chaos on the sidewalk. I would love to know what the young men told their fellow Marines the next day about going to a Chinese whore house and finding him and his family inside. Yup! You know the look. Sigh.